What size radiators do I need for my property? To heat your offices efficiently you will need to make sure you choose radiators with the right wattage for the size of your rooms. We’ve made this easy with an interactive radiator calculator which will calculate the total wattage required based on the dimensions of each of your rooms. Then all you have to do is choose radiators which add up to, or exceed, your required wattage. You will find electric radiators in a wide range of sizes at Electric Radiators Direct – so whether you’re heating an expansive boardroom or a tiny maintenance room, you’re sure to find the perfect combination to heat your rooms efficiently. Don’t be tempted to cut corners – under-specifying your heating can cut costs initially, but will leave your rooms chilly and force your radiators to work inefficiently in their attempt to heat the space. Why are offices difficult to heat? There are many reasons why your office might be difficult to heat. Perhaps your office has high ceilings, single glazed windows or a door that never stops opening. Perhaps your office has poor insulation, walls comprised mostly from glass or an overactive air conditioning system. But no matter what the shape, style or size of your office, it’s certain to share the same heating challenge that’s faced by offices everywhere across the country: how to keep everyone happy in rooms filled with different people – each with their own temperature preferences. It’s a scenario I’m sure we’ve all come across at some point in our working lives – whether you’ve worked in an office all your life or you just have dim memories of a temporary job from way-back-when. Arguments about the heating seem to be as much a universal part of office life as tea breaks, post-it notes and problems with the printer. The new apprentice is inevitably too cold, coming to work in three jumpers while her manager blithely opens all the windows because he’s too hot in his shirtsleeves. The graphic designers battle it out with the customer service team to gain control of a portable fan heater – whilst Stuart from accounts helpfully leaves the door open whenever he leaves because he thinks it’s too warm. And who can’t empathise with the poor folk in marketing when the managing director declares that she’s lowered the thermostat for the entire building because it’s too hot in the sales office? It’s a scenario familiar to anyone who’s worked in an office – but could there be a heating solution that keeps everyone happy? What makes electric radiators a good choice for offices? Whilst nothing will change the fact that everyone has different preferences when it comes to heating, a more accurately controlled heating system that keeps temperatures consistent across the building will mean fewer arguments – and excellent energy savings. Each of our electric radiators boasts a highly accurate digital thermostat which measures the temperature in each individual office and maintains your chosen comfort temperatures. That means if the room temperature rises in a tense meeting your radiators won’t keep working hard to top up the heat – they’ll switch off until the room cools down. Equally if there’s a sudden dip in the temperature the thermostat will kick the radiator back into life to maintain everyone’s comfort. Individual thermostats are very useful in office environments because they make sure each office is heated to the correct degree. Large offices heated with gas central heating suffer from a central thermostat that gives a temperature reading which may not be representative of the rest of the building. An energetic office packed full of busy people will naturally need less heating than a half empty office with draughty doors and windows; individual thermostats in each office ensure that everyone stays warm with no wasted energy. You can also make use of 24/7 programmable timers built into the body of many of our electric radiators. These smart electronic timers allow you to set a heating schedule to suit each individual office – keeping everyone warm whilst cutting wasted energy down to a minimum. Perhaps the accounts team always come in an hour early? You can programme the radiators in the accounts office to start warming up at 7:30am. Maybe the managing director always takes Wednesday afternoons off? No problem – you can programme the radiator in her office to switch off after 1pm. And at the end of the day you can make sure that all the radiators in the building are programmed to switch to anti-freeze mode at 5pm on a Friday, ready for the weekend. Are electric radiators safe to use in commercial properties? 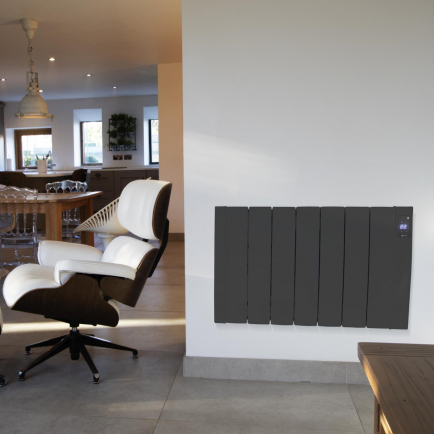 Electric radiators offer an exceptionally safe heating solution. Unlike gas boilers they do not contain fuel combusting elements, so they cannot produce carbon monoxide. This means they do not require an annual service or regular testing. Electric radiators are a good choice in commercial and public buildings because they are not difficult to control and do not require specialist knowledge to programme and maintain. Heating safety can sometimes fall by the wayside in busy workplaces where no-one’s quite sure whose responsibility it is to look after the boiler. With electric radiators you can end that uncertainty once and for all with clean, carbon-neutral heating. For added confidence in their safe operation, our electric radiators are all fitted with thermal safety limiters which cut power to the radiators if they sense a rise in temperature above set safety limits. This ensures your radiators will never overheat and will stay safe all year round – whatever the weather. What’s the best electric radiator to use in offices with high ceilings? If you’re struggling to find an efficient heating solution for a high-ceilinged office, commercial building or public property, you might want to consider one of our electric ranges specifically designed to tackle larger rooms. The Haverland Inerzia range uses lightweight ceramic stones to send out heat at a higher intensity, ensuring that the heat stretches to every corner of the room. The ceramic stones boast excellent heat retention properties, helping the Inerzia maintain your comfort temperatures at optimal energy efficiency. Inerzia radiators are ideal for use in high-ceilinged rooms, open-plan offices, roomy community halls, stairways, hallways and waiting rooms. Please note that if your commercial building has ceiling heights of over 2.7m our radiator calculator will no longer provide an accurate indication of the wattage needed to heat the rooms. In this case we recommend giving our friendly sales team a call. They will offer you a personalised heating plan based on the dimensions of your property, along with a free, no obligation quote. When it comes to heating offices and commercial properties, it can be difficult to keep everyone happy with a single, centrally operated heating system. 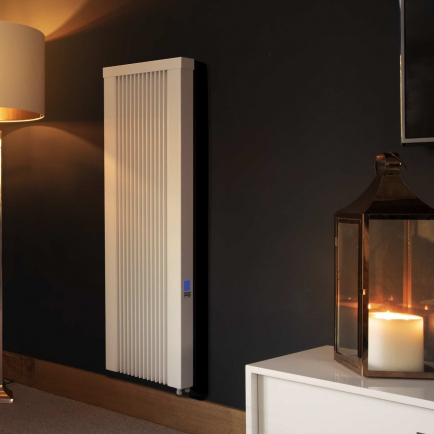 Electric radiators offer an ideal alternative: with in-depth zoning control, high precision thermostats and stylish contemporary designs, electric radiators give you the control you need to keep everyone comfortable. Electric radiators are also a very safe option, with low surface temperature options, no fuel-burning elements, no carbon emissions and no maintenance required – giving you the peace of mind you need in commercial and public locations.